According to the December 2008 issue of Consumer Reports, you could save at least $345 per year by brewing your coffee at home instead of buying a few 16-oz cups a week – and that includes the cost of coffee and filters. You’d save more if you regularly by specialty coffees because they’re easy to make at home, too. All you need is a good coffeemaker to get you motivated to brew your own coffee at home, whether you’re starting from scratch or replacing a less-than-satisfactory model. 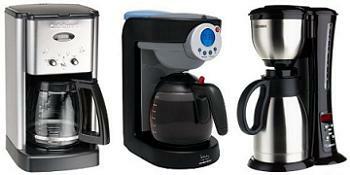 Consumer Reports rated 8 to 12 cup brewers on performance, convenience and carafe handling and picked out several top machines. Their top choices were the Cuisinart Brew Central DCC-1200, the Michael Graves 40304, the Oster Counterforms 4281 and the Zojirushi Fresh Brew EC-BD15. The Cuisinart scored the highest – excellent in all categories – while the Michael Graves model score a “best buy” with a price tag of only $40. When choosing, you may want to take into account whether the unit is programmable, has a thermal carafe and offers brew strength control so you can pick a coffeemaker that will best suit your routine and coffee needs. For instance, the Zojirushi is the only one of CR’s top picks that offered a thermal carafe – a feature that is an absolute must-have for me and many others who like to be able to enjoy a warm, fresh pot of coffee over an entire morning without the coffee burning on a hot plate in a glass carafe.